In a large bowl, combine the flour, baking powder and salt. In another bowl, whisk the rice milk, applesauce, oil and vanilla; stir into dry ingredients just until moistened. Stir in bananas and chocolate chips if desired. Pour batter by 1/4 cupfuls onto a hot griddle coated with cooking spray; turn when bubbles form on top. Cook until the second side is golden brown. Serve with syrup. Yield: 12 pancakes. 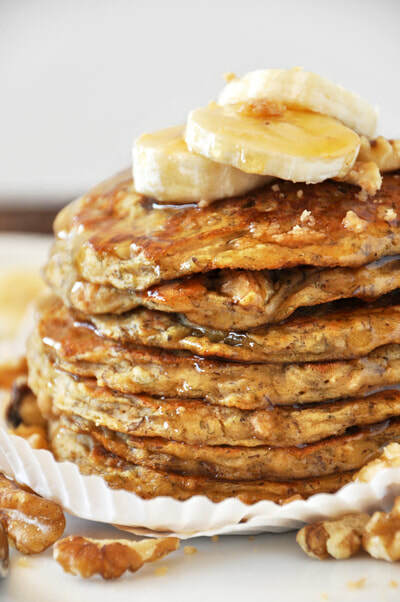 These gingerbread pancakes are full of warm spices, packed with protein and are naturally gluten free. 1. Place oats in a food processor or blender and pulse until flour forms. It doesn't have to be perfectly smooth. 2. In a medium bowl, whisk together oat flour, protein powder, cinnamon, nutmeg, ground ginger, baking powder, salt and ground cloves. 3. In a small bowl, combine wet ingredients: mashed banana, egg, milk, molasses and vanilla. Slowly add wet ingredients to the dry and mix until just combined. 4. Heat griddle over medium heat and spray with cooking spray. Working ¼ cup at a time, pour batter onto heated griddle. Cook first side until bubbles begin to form, about 2 minutes. Flip pancakes and cook additional 2 minutes or until other side is lightly browned. 5. Serve with maple syrup and butter if you wish. Once your griddle heats up, feel free to reduce heat to medium-low or even low to avoid burning pancakes before they are fully cooked. If batter seems too dry, add ¼ cup additional milk. 1. In a saucepan, combine cocoa powder and virgin coconut oil. Melt on low heat, stirring continuously. 2. Add honey and stir for 1-2 minutes until combined. 3. Remove from heat. Let cool for 1-2 minutes. 5. Line an 8×8 glass dish with parchment paper. Pour chocolate mixture into the dish. 6. Put in the freezer for 30 minutes (or until hard). 7. Remove from the freezer, break into squares and enjoy! 8. 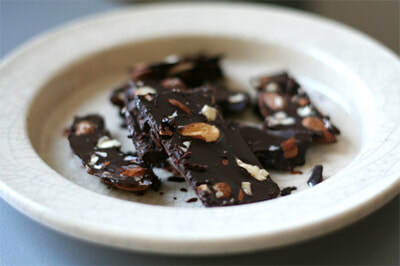 Store in the fridge, otherwise chocolate bark will melt. Mix pureed strawberries, yogurt, honey, and pinch of salt in a food processor or blender. 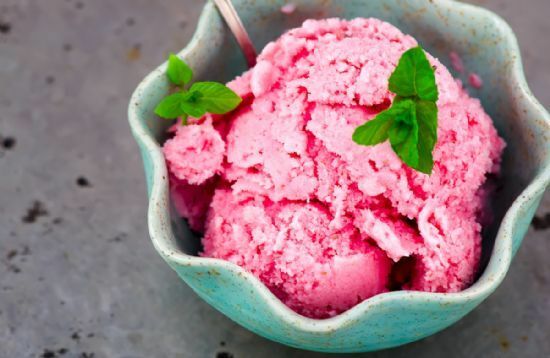 Chill the mixture in the refrigerator for 2 hours and then churn in an electric ice cream maker according to manufacturer's directions. Freeze for at least 4 hours before serving. 3. Scoop out spoonfulls of the dough, roll into balls and place on a cookie sheet. Optional: flatten the cookies on the sheet and place one dark chocolate chip in the middle of each cookie. Bake for 6-8 minutes, do not overbake, cookies are best when barely brown on the bottom and still soft. Adjust rack of oven to middle level and preheat oven to 350 degrees F. Line a large baking sheet with parchment paper. In a large bowl, combine peanut butter, sugar, and egg until smooth and evenly mixed. Drop tablespoon-sized spoonfuls of dough onto the prepared baking sheet, leaving 1 inch of space between all cookies. Using the tines of a fork, press down on cookies to make a cross-hatch pattern. The cookies should be about 1/3-inch thick. Bake for 6 minutes for soft cookies and 8 to 10 minutes for firmer cookies. Be careful not to over-bake cookies, making sure they do not get too dark. Cookies should still be soft when you remove them from oven. Remove baking sheet and allow cookies to cool on the baking sheet for 5 minutes before serving. 2.Melt butter over low heat. Remove from heat and allow to cool slightly (5 minutes). 3.Stir in sugar, cocoa powder, and salt. 4.Whisk in eggs and vanilla. 5.Add rice flour, tapioca flour, and corn starch one at a time, whisking well after each addition. 6.Add walnuts or pecans if desired. 7.Spread into greased 8x8" square baking pan. 8.Bake for 25 to 30 minutes or until toothpick inserted near center comes out with just a few sticky crumbs on it. 9. *Although these brownies are great warm, I prefer them cooled down, chilled, and then cut into small squares. Seems like the flavors come out better that way. 10. ***These are rich enough that you really can cut them into 16 pieces, but let's be realistic - I cut 8. Combine the crushed pineapple with the vanilla Greek yogurt in a small bowl and set aside. 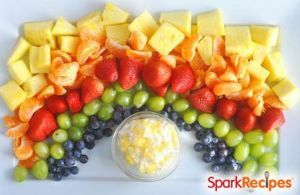 On a large platter, arrange the fruit one color at a time, beginning with the pineapple, then the oranges, strawberries, grapes, and blueberries. Place the dip in the center of the "rainbow." Preheat oven to 350 degrees F. Lightly grease a 9-inch cake pan with coconut oil or butter and fit a circular piece of parchment paper at the bottom of the pan. Cook the cranberries and ½ cup of maple syrup in a small saucepan set over medium-high heat for 10 minutes, until the berries have popped. Mash them slightly with the back of a spoon. Remove from heat and set aside. Meanwhile, in another small saucepan, melt the butter, remaining ¼ cup maple syrup, and ½ cup coconut crystals until the sugars are dissolved, about 10 minutes over medium heat. Remove from heat and set aside. Add the 4 eggs, unsweetened almond butter or sunflower butter, coconut flour, unsweetened cocoa powder, ginger, lemon zest and juice, vanilla extract, baking soda, cinnamon, sea salt and cardamom to a blender or food processor. Blend for 30 seconds on high until fully combined and smooth. Add the melted butter mixture and blend again for 30 seconds. Reserve ½ cup of the cooled cranberry compote for serving then drop dollops of the remaining compote and chocolate chunks all around the pan. Swirl with a knife until mostly incorporated. Cool on a wire rack for 1 hour before serving. Store leftovers tightly wrapped in the refrigerator. Serve with reserved cranberry compote and coconut milk whipped cream if desired. Pour lentils in a bowl, cover with water, and allow to sit overnight. Over medium heat, cook onions in olive oil in a large soup pan. Add garlic and celery. Once celery begins to soften, add carrots, tomatoes, bay leaf and vegetable stock. Bring to a boil, reduce heat, and allow the soup to simmer for 30 minutes. Remove and discard bay leaf and add vinegar. Season with salt and pepper to taste. (Editor's note) : This recipe is part of their new e-book: "SparkPeople's Ultimate Grilling Guide: 75 Hearty, Healthy Recipes You Can Really Sink Your Teeth Into," available now on Barnes and Noble and Amazon for $1.99. Preheat the grill to 375 degrees. Scrape the grill grates to remove any burned-on food residue. Cut the chicken breasts into 3-4-ounce portions. Pat the meat dry with a paper towel. Lightly coat them with cooking spray. Sprinkle both sides with the rub. To achieve the traditional crosshatch markings, place each breast onto a preheated grill with the breast facing the "10:00" position. Close the lid, and cook for 3-4 minutes. Open the lid, rotate the breast to the "2:00" position, and cook an additional 3-4 minutes. Open the lid again, flip the breasts, and cook until the internal temperature reaches 165 degrees, about 4 more minutes. Remove from the grill and allow to rest for 1-2 minutes before slicing. Serve with the criss-cross grill marks facing up. In a saucepan add lentils and chicken stock, ginger and turmeric. 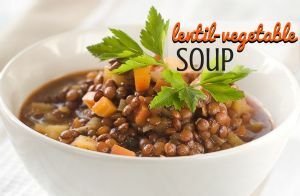 Bring to boil cover partially and cook for 20 minutes on medium heat until lentils are tender. Puree 1 c of lentils in a blender, add back to pan and cook 15 minutes more. Add mustard seed and shake pan until they start to pop, 20 seconds. Add the onion and cook until softened, 5- minutes. Add serrano chile, and garlic, cook 1 minute. Add cumin and bay leaves, and tomato, cook minutes more. Stir this mixture into the lentils, add lemon juice and salt to taste, simmer for 5 minutes. Cook’s note: The traditional Ethiopian berbere spice blend is formed into a paste by mixing it with oil; it is not a must but this process can add more concentrated flavor to the dish. In a deep stew-pot, heat up the oil. Add chopped onion and sauté on a medium high heat for 10 minutes. Add chopped ginger and garlic and sauté for about five minutes on medium heat. Add Ethiopian berbere spice mix and sauté until fragrant. Add chopped tomatoes and sauté on high heat for 12 minutes. Add dry lentils and sauté for a few minutes than add water and salt. Reduce the heat and simmer on low for 20 minutes – gently stirring to prevent burning. The stew should be thick; if you have extra liquid please uncover and cook for 10 minutes in order to reduce the water. Tastes great served over rice and eaten with flatbread as a substitute for the traditional injera bread. In a medium bowl, combine flour, seasoning salt, salt, black pepper, sugar, and paprika. Mix well. In a medium bowl, combine buttermilk, eggs, baking powder, and baking soda. Whisk together until batter is smooth. Dip chicken into buttermilk mixture, allowing excess to drip off. Roll in flour mixture. Dip again into buttermilk mixture and roll in flour mixture. Place on plate until oil is hot. Repeat with remaining chicken pieces. In a large heavy bottom skillet or Dutch oven that has a lid, add oil. For chicken tenders it should be at least ½ inch depth, and for broiler chicken ½ inch to ¾ inch depth. Heat oil until it reaches 365 degrees. Fry chicken skin side or flesh side down. Cover chicken with lid and reduce heat to medium. Fry for 7-9 minutes or until bottom side is golden brown. Flip chicken over and fry for additional 7-9 minutes or until bottom side is golden brown. You may need to rearrange chicken if needed. Internal temp should be 165-170 degrees. Remove chicken and serve, or place in 175 degree oven until all your frying is done. GFM TIP: When frying GF chicken, flip chicken carefully. Don’t move the chicken around too much as the coating will come off. Be patient and let the chicken cook on each side until it is thoroughly cooked. Gently move to serving plate. green onions and avocado slices and serve. 1. 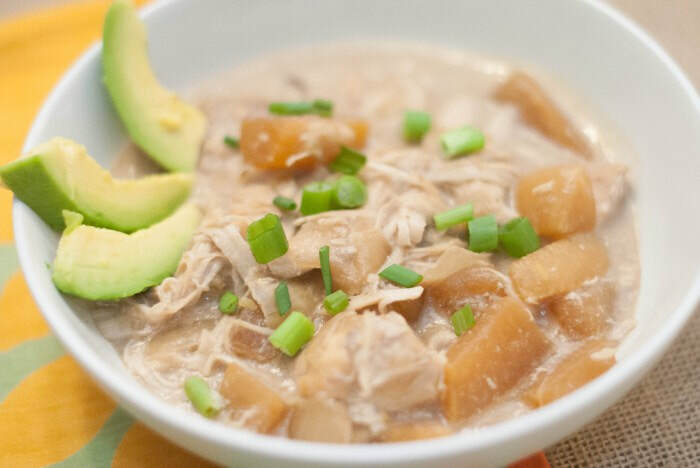 Poke the top of the spaghetti squash, then add it to the slow cooker with 2 cups of water. Let it steam for 4 to 6 hours. 2. Remove the slow cooker lid. When it’s cool enough to touch, cut the squash in half and remove the seeds. Using a fork scrape the squash out of it’s skin, into a baking dish or dutch oven. 3. Add several slices of the cheese to the spaghetti squash to create the sauce. Heat if needed to melt the cheese. 4. Add some bacon grease to a pan over low / med heat. Add some minced garlic, and let it cook slightly, being careful not to burn. 5. Add a few handfuls of fresh spinach to the garlic and toss to coat. Turn off the heat and put the lid on to wilt the spinach. 6. Add the spinach with garlic, bacon, more cheese (shredded), and scallions to the spaghetti squash.